Root canal treatment is used to save teeth which would otherwise need to be removed. The infection can cause an abscess. ❓ What is an abscess, and what causes it? ❗ “Sometimes, due to trauma or decay the “nerve” inside the tooth dies off. Any passing bacteria find this a source of nourishment and proceed to munch on the dead nerve and have lots of babies 😀 . Your body can’t do anything about this infection because along with the nerve dying, the blood supply to the tooth dies off too, so the body can’t send in some antibacterial cells (white blood cells) to attack the bugs. Eventually, the bugs start to spill out of the tooth and into the tiny space between the tooth and the jawbone. This starts an abscess, the body reacts to the invasion by pouring in defensive cells, which kill most of the bugs in the area, but still can’t get to the source of the problem, which is in the tooth. How is root canal treatment done? There are other steps in between (see below). The tooth pictured here only has one canal, but molars have 3 or more. What does root canal treatment feel like? There are lots of technical descriptions of root canal treatment on the internet (for a list of websites, scroll to the bottom of this page). But what does it actually feel like from a patient’s perspective? Since so many people seem to recoil in horror when they hear some friend or other is having (or has had) a root canal treatment on their tooth, I thought I’d share my own root canal experiences. I had cold sensitivity develop in a molar tooth which had previously been filled twice by different dentists, in the 1970s and in the 2000s. X-rays, cold air-spray, the probe and tooth sleuth (a plastic thing you bite down on each cusp individually to see if the tooth is cracked) all proved inconclusive. So I was sent away but told to return immediately, if/when it got worse. Well it took a few days but eventually I realised the weird pressure build-up sensations and spontaneous twinges in my tooth probably fell into the category of ‘getting worse’. My dentist agreed that we needed to now take action. He explained that the nerve was in the process of dying and the best thing to do would be a root canal treatment to save my tooth. The first appointment involved opening the tooth up, taking out the nerve to stop the toothache, cleaning out, finding and disinfecting all the canals; and placing a medicated temporary dressing. I gave my verbal consent and my dentist imperceptibly and very slowly numbed me up. After a couple of minutes I felt outstandingly numb – this was reassuring to me. I was charmed into lying back once again by his kind comment that there was not going to be any pain involved whatsoever. After waiting a while longer, he then tested gently with the explorer and asked if anything felt sharp. My answer was no, so all good to go. The next step was putting on the ‘rubber dam’ which was new to me. It can be a bit fiddly but you are already numb by this point. If appropriate they may quickly clean the tooth in question before gently anchoring a special clamp with a frame around your tooth and then stretching a piece of rubber over the frame which they then adjust, usually so that only the tooth to be treated is visible in the dentist’s work area. Using the rubber dam provides essential isolation from saliva for the tooth being treated. It also had the benefit for me whilst lying there that I could ‘swallow’ easily when I needed to and that I was in no danger of accidentally gulping down the treatment debris including old filling material and the bleach later used to disinfect the canals. It also protected me in the unlikely event of there being any dropped instruments/files. You may also be given the option of using a ‘soft bite block’ if you find it comfortable and easier on your jaw joint but it is not compulsory. I was offered a soft bite block but it didn’t fit well so I shook my head and he immediately removed it and I did just fine without. At least 20 minutes had now passed. Next up was probably the most nerve-wracking moment for a modern RCT virgin… but I already trusted this guy from previous treatment, so I generously gave the benefit of the doubt, when he informed me that he was now going to open up the tooth (by drilling into it with the handpiece in case you were still wondering!). Before doing so, he reiterated that it was not supposed to hurt at all and if I felt anything untoward, I must signal at once by raising my arm. He further reassured me that it was not a problem to top-up the anaesthetic at any point. So then came the noise and some vibration….after a couple of seconds, he stopped to check that I was indeed totally pain-free, I confirmed and he gently continued. The level of vibration/pressure sensations is similar to that for a regular filling (especially when the tooth is initially being opened up/old filling material being removed). Unwelcome to some but tolerable to me so long as nothing hurts. For the next 90 minutes he stayed totally calm and apparently happily absorbed in intricately working on my tooth. Some anxious patients might prefer more of a ‘running commentary’ (just ask if you do) but I was happy to let him give most attention to the tooth. Because I was wearing safety goggles with quite a thick rim and because I was tipped back, I couldn’t really see very much at all of what was going on, unless I made a real effort to watch. This means if you don’t want to see, you can just relax and close your eyes, or as per my preference, alternate between staring at the boring ceiling and peeking at the proceedings. However at one point, I was so relaxed that I found myself beginning to nod off. Some of the time, it was noisy with the canals being explored using longish L-shaped pointed attachments to the handpiece. But most of the time, it was quiet with the assistant handing various tiny files to the dentist (he kept asking for particular numbers) which he then either attached to the root canal system handpiece or more often than not used by hand to carefully navigate the canals, gently rotating them to feel his way to the apex. Occasionally I was asked to adjust my head position slightly… just like at the hairdresser’s. There was quiet music playing in the background. Some people (and I now agree despite having initially been sceptical) have reported that it is a more relaxing experience than a conventional filling, despite taking longer. The difference is I think, the extensive above-mentioned periods of quiet concentrated work. At various stages (probably no more than 3 times per appointment) a digital x-ray was taken to confirm progress. At frequent intervals I glimpsed a syringe-like nozzle (no needle) which was simply used to squirt the bleach down the canals. The liquid was then suctioned back out. This alternating process of exploration/shaping and disinfection was repeated endlessly it seems, until suddenly the rubber dam was removed and I was all done! The time had passed surprisingly quickly and I felt a bit euphoric knowing that the toothache had finally been banished. My jaw felt a bit stiff understandably and the local lasted ages longer before it wore off which was fine by me. The tooth sported a temporary sedative filling and looked slightly open still. I went away having been assured that the second appointment would be very similar with more shaping and a substance called gutta percha being placed as the final filling material, topped off with composite and that it would eventually be wise to get the tooth crowned, once we were sure the treatment had been a success. Between appointments (2 weeks) I had minimal discomfort, just slight soreness occasionally, almost as if the tooth/gum were bruised. At the second appointment, despite the nerve having already been removed, I was automatically numbed up. It really was – as had been suggested – painstaking work with no stress for me, except for having to keep my mouth open for so long. The main difference was that the ‘plugger’ was used a lot more, since this was the stage where the gutta percha cones (pieces) were gently pushed down to the bottom of the canals – the goal was to have no gaps. Towards the end, I could sense some heat coming off something inserted in my tooth – I think this was probably serving to melt the gutta percha? The last stage was doing the composite filling. This was done very thinly in lots of separate layers and the usual curing light was used multiple times. My bite was then checked on a strip of paper. I was advised to take nurofen for the jaw-joint as soon as I got home and I did so but I felt no need to take a second dose. This root canal treatment proved to be successful and I later had the tooth crowned. Teeth that have had root canal treatment are more brittle and a crown provides extra support and strength to the tooth, especially if it is a back tooth. Depending on the amount of tooth structure that has been lost, it may also be possible to opt for an onlay or a three-quarter crown. I subsequently had an old root canal (done in the early 1990s by a general dentist) re-treated at an endodontist. He also did a great job – again over 2 long appointments. The only real difference between him and my dentist was the use of the endodontic microscope at the first appointment and a general air of confidence as to likely success. I was quoted 85% success rate which apparently is high for a re-treatment. I was told the only real downside of treatment were if a file broke off in the lower portion of a tooth root, it might be hard or impossible to retrieve. However this was quickly followed up by an assurance that it had been years since he had had such an incident so I probably shouldn’t lose any sleep over this remote possibility. I was also aware of the endodontist measuring the canals from time to time – he wore a special ring on his finger with a ruler scale on it. My dentist had used an electronic device instead. 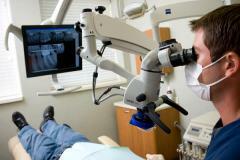 An endodontist is a dentist who specialises in root canal treatment. Ask a Dentist: Under which circumstances would you choose an endodontist? Why am I in pain after root canal treatment? I thought the nerve had been removed? It should be manageable with maybe a little bit of an anti-inflammatory drug like ibuprofen or similar. Why does root canal treatment have such a bad reputation? You may have heard people say that root canal treatment is very painful, or you may have had such an experience yourself. The most common reason for painful root treatment is that the dentist finds it difficult to numb your tooth because of an acute abscess. You can read why, and what can be done about it, here: How to numb a Hot Tooth. Done competently by someone who cares for the quality of the patient experience, root canal treatment should be a pain-free procedure with just local anaesthetic. If profound anaesthesia cannot be achieved for whatever reason, it is time to rethink all options including sedation. Bear in mind that specialist endodontists will have been trained in advanced numbing techniques for hard-to-numb teeth. Don’t be afraid to approach a medical doctor for antibiotics, if an acute infection is present and you’re in pain. Your dentist can prescribe these too but some are reluctant to do so. It is your right to be numbed for the second appointment even though the nerve is likely already gone. It makes work on the surrounding tissue much more comfortable regardless and gives longer-lasting relief from any discomfort afterwards. It is easier to prevent pain than to make it go away once it has started. Take ibuprofen (or, if you can’t take it e.g. because you have asthma or other contraindications, take paracetamol) before the local anaesthetic has worn off. Ask your dentist or endodontist which painkiller they recommend. Ask your dentist what they would do if it were their own tooth. Would they see an endodontist, or is it an easy enough job for a general dentist? Ask your dentist what s/he reckons their success rate for the tooth in question will be, and how long they reckon it’ll last. If the odds strike you as unacceptably low, or if the answer is along the lines of “they last about 5 years max”, you may want to ask for a referral to an endodontist (a root canal specialist) and see what they think the chances of success are. You can also search for an endodontist in your area here (UK only). Ask if they are going to use a rubber dam. It will not only protect you from tasting nasty substances – it will make it much more likely that the treatment works! But some dentists still don’t use one. Ask if they will wear loupes (to obtain some kind of magnification benefit over the naked eye). Ask if it is possible to get an onlay or a three-quarter crown (all back teeth that have been root treated should have an onlay, three-quarter crown or full crown to protect them, depending on the amount of tooth structure left and what the x-rays show. The most conservative option is an onlay, but if there’s not much tooth structure left, a full crown will be needed). Nowadays, the trend is towards preserving as much tooth structure as possible, and onlays are becoming increasingly popular. Endodontists have special equipment (such as a really good microscope – see photo) and advanced training in root canal treatment. Especially for more complex root canal treatments and for re-treatments where a root canal has failed, their chances of success are higher (in some cases much, much higher) than those of general dentists. This is not to say that general dentists cannot competently carry out root canal treatment. There are many who do enjoy it and who have done additional training in endodontic therapy since qualifying. But root canal treatment is not for everyone – it is very intricate, requires a lot of patience, a lot of time (which can be a big problem for NHS dentists in the U.K.) and many dentists don’t like doing it. So it’s best to agree up-front (even with an experienced dentist) that if any unforeseen problems are encountered, you would like to be referred on to an endodontist. This is assuming you can afford this option. Because endodontists have had to invest in additional equipment and training, they tend to charge more than a general dentist. Also, this option is not usually available on the NHS (if you are in the UK). You don’t need a referral to see an endodontist – you can pick your own. If you’re in the UK, the British Endodontic Society’s website allows you to search for an endodontist. The search by county doesn’t seem to work very well, as it omits some entries, so make sure you search for all towns that are close to you. What can I do if root canal treatment has failed? Often, it’s possible to redo the treatment (this is best done by an endodontist) – even when the tooth is badly broken down. Ask your dentist about this option, or make a consultation appointment with an endodontist if you are in any doubt. Can you take breaks during root canal treatment? Animated-Teeth.com: Root Canal Treatment 8 pages of very detailed information about all aspects of root canal treatment. Patient Information (British Endodontic Society) Common questions and answers about root canal treatment. Root Canals (Ask Doctor Spiller) In-depth information about root canals – what they are, how they are done, do they work, pain issues, information on crowns, and information about two quack scams – the supposed “Root Canal Cover Up” and “NICO”. Root Canal? -‘Ugh, rather you than me!’ (PDF) A description of three root canal treatment experiences from the perspective of one of our administrators (excerpts have been used on this page – the PDF file goes into much more detail and gives additional information). The information on this page has been provided by the Dental Fear Central Web Team. Last reviewed on December 3, 2018. We welcome your feedback on our information resources.